3. Place blanket on ground. 4. Lie down on blanket. Include bug spray, friends, and telescopes to taste. Although the show started last night, tonight you can catch the grand finale of the biggest heavenly event of the summer: the Perseid meteor shower. As earth travels in the Swift-Tuttle comet's dusty wake, the night sky reveals us caught in a fire storm of ice-bound dust sizzling in our atmosphere. We call these "shooting stars" the Perseids because they seem to emanate from the constellation Perseus, named after the hero from Greek mythology who slew Medusa. Look for them streaking out from the northeast part of the sky near a Y-shaped constellation. According to a late report from National Geographic, the Perseids are even showier this year because of a distant friend in the solar system—Saturn. As Swift-Tuttle swung by the giant a few years ago, Saturn's gravity clumped a portion of its tail together. 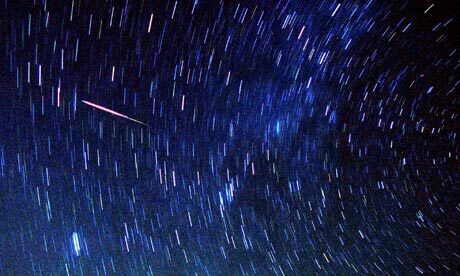 Tonight we'll be cruising through the thick of the meteors, so you'll be seeing up to 100 meteors an hour. Great news for people with short attention spans, like your blogger. There are three things that might get in the way of your meteor-viewing: the moon, light pollution, and clouds. The moon was full just a few days ago and is still pretty fat, so its light will make the Perseids harder to see if you're in North America. If you're contending with blazing streetlights, as someone who grew up thinking there were four five stars in the entire universe, I sympathize. Another option for those contending with cloudy skies is to sit back with this gorgeous Hubble video. By pointing the Advanced Camera for Surveys at apparently black space and letting distnat light fall on the sensor for ten days, astronomers were able to peer deep into the universe to create what's known as the "Hubble Ultra Deep Field," an image swimming with distant galaxies. The red-shift of the light from these galaxies gives away how far from us they are. Add some ethereal opera music and computer magic, and voila! A simulated 3-D fly-through of a universe so densely populated with galaxies it's absolutely mind-boggling. So you can tell your lucky friends in places like, say, rural Arizona, that meteors are so August 12 - galaxies are more your taste, thank you very much.